Just what are “our interests” in the South China Sea? Remembering a Russian forecast of America’s breakup… scrambled partisan lines… monthly payouts way better than Social Security… and more! The irony of Donald Trump is that the man who’s eager to avert a new cold war with nuclear-armed Russia is liable to stumble into a hot war with nuclear-armed China. The headlines from yesterday’s first full weekday of the Trump presidency were dominated by noise. An executive order withdrawing from the awful Trans-Pacific Partnership? Not a surprise. The hiring freeze for federal workers? Whatever, the federal workforce is already the smallest since 2008. A promise to cut regulations by 75%? Believe it when you see it. 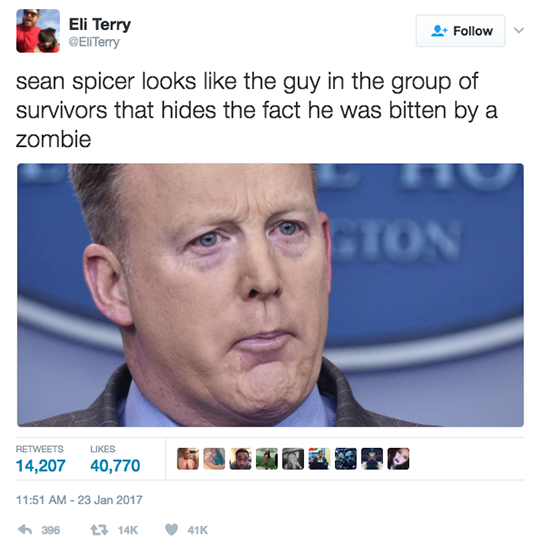 Lost in all that noise was the briefing by the new White House press secretary Sean Spicer. “The U.S. is going to make sure we protect our interests” in the South China Sea, he said. For an administration that’s supposed to be “isolationist”… it sure seems to be ratcheting up Hillary Clinton’s “Asian pivot” policy. We’ve been on the case from the beginning here at The 5: During her term as secretary of state in late 2011, Clinton laid out an Obama administration plan in Foreign Policy magazine, shifting America’s global military priorities. The United States would wind down its wars in the Islamic world and “pivot” to the Asia-Pacific region — where the Pentagon would position 60% of its naval assets by 2020. Chinese leaders understandably saw themselves as the target of the pivot. “America’s strategic move east is aimed in practical terms at pinning down and containing China and counterbalancing China’s development,” said the state news agency Xinhua. Note those two circles in the lower left; that’s the disputed territory in the South China Sea. It’s claimed by not only China but by Vietnam, Malaysia, Taiwan, Brunei and the Philippines. In the event of conflict between China and the Philippines, the United States has treaty obligations to side with the Philippines. “It’s just a matter of time before some incident or accident at sea sparks a war,” says Jim Rickards. For months, the United States has conducted “freedom of navigation” patrols in the South China Sea — not that China is threatening anyone’s freedom to navigate the waters it claims. And as we mentioned last week, Secretary of State-designate Rex Tillerson has proposed blockading the South China Sea. But let’s leave aside the worst-case scenario right now. Let’s connect the dots between Hillary’s pivot and one of Trump’s major campaign pledges. 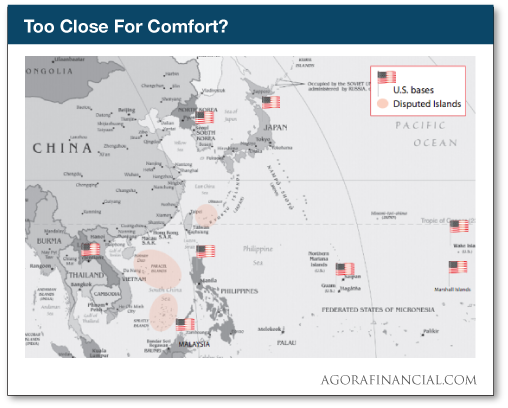 Under the pivot, the military is slowly concentrating its naval forces in the Asia-Pacific region. Meanwhile, a Trump campaign memo from last October promises “a Manhattan Project urgency to rebuild our navy.” At present, the Navy has 272 deployable ships; Trump wants to grow that to 350. That won’t come cheap. The Congressional Research Service’s naval specialist said this month that’ll cost at least $5 billion a year for the next 30 years. And that’s just to build the ships; day-to-day operations and maintenance will be even more. While we’ve been forecasting a collision between Trump and a GOP Congress over spending priorities — and we still expect that to be the case — Republicans have generally been united in pushing for more military spending. Even in these early days of the Trump administration, Jim Rickards and his team have identified a handful of tiny companies in the defense sector set for massive growth — with the potential to quadruple your money or even better. Note well: Not everyone is cut out to invest in recommendations like these. Are you? Follow this link and Jim tells you just what it takes — no long video to watch. To the markets, where Dow 20,000 is elusive as ever. The Big Board is up a quarter-percent this morning, but that’s good only for about 19,850. Energy shares are rallying now that Trump has signed an executive order reversing the Obama administration’s decisions to nix the Keystone XL pipeline expansion and the Dakota Access Pipeline. Crude is up more than 1%, at $53.46. Traders are chewing on a boatload of earnings reports. The only thing that jumps out is Yahoo, which beat expectations but also said its acquisition by Verizon probably won’t happen now until the second quarter. Reading between the lines, Verizon almost surely wants to renegotiate the terms now that Yahoo’s value has been dented by two epic data breaches. 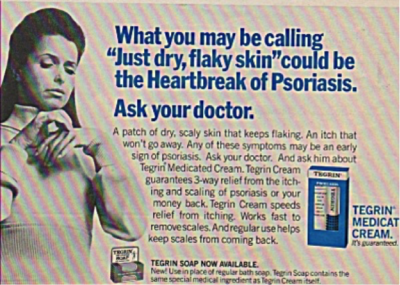 Fun fact for younger readers: The phrase “the heartbreak of psoriasis” originates with a 1960s ad campaign for Tegrin shampoos and skin lotions. Fifty years on and the pharmaceutical industry is still on a quest for an effective way to treat hard-core cases. “Psoriasis affects about 100 million people worldwide, with almost 10 million in the United States,” says Ray Blanco of our science-and-wealth team. Last year, Ray recommended Anacor Pharmaceuticals in his FDA Trader service — a company on the cusp of introducing new psoriasis products. The company got bought out, delivering a 51% gain in only two weeks. Now Ray’s on the case of another company looking to reach the same market: “If it succeeds in commercializing its dermatological products, we’ll be on track to seeing gains that will dwarf what occurred with Anacor. “This company is in the middle of multiple Phase 3 trials for psoriasis, which is estimated to be a market worth over $4 billion per year.” Early results from one of those trials are promising, with 75% of patients showing improvement. “By June,” says Ray, “successful results in two dermatological indications, a Phase 3 launch in a third and imminent regulatory filings will put us in a position for triple-digit gains.” That’s the power of the “magic calendar” Ray uses in FDA Trader. In fact, one of the companies he’s following has a key date only days from now. Details here. “I believe it was in one of your newsletters where I read sometime back that an ex-KGB analyst suggested that the U.S. would fracture into six distinct geographical parts politically. “I submit to you that it did fracture into at least three. I feel it is possible that the Russian involvement was not to help Trump or undermine Clinton but to start to accelerate the natural divisions within our country and then sit back and watch us unravel. “The high school I attended had several rivalries with other schools, as did those schools. One year before a big football game between two other rivals, somebody burned a large L in one school’s lawn and a large T in the other school’s lawn, each being the first letter of the other school’s name. It must have been fun to ‘sit back and watch’ those two beat the dickens out of each other during that game. The 5: Did you see the Reuters/Ipsos poll showing a third of Californians support seceding from the union now that Trump’s in power? “I’m confused,” writes a confused reader after we mentioned a street disturbance in real-time on Inauguration Day. “If the window-smashing protesters’ BFF (best friend forever) Hillary had been elected, would these same folks then have smashed the windows of Goldman Sachs, instead of Bank of America? The 5: Interesting times these are. Bernie Sanders praises Trump for junking the Trans-Pacific Partnership and the Democratic establishment loses it. Meanwhile, 14 Senate Democrats, including Chuck Schumer and Dianne Feinstein, vote to confirm Trump’s pick to run the CIA and no one bats an eye. Oh, and the limo the protesters torched on Friday? Owned by a Muslim immigrant. P.S. We just uncovered something shocking that could mean the difference between collecting a meager $1,000 from Social Security… or getting up to $6,235 a month you can use for your retirement. That’s real cash deposited in your account… coming from the private sector. But according to a law that governs this special situation, you must act before April 21. Click here to get started today.